“Never a dull moment in the bush” is something my husband and I tell each other all the time. Well, that is certainly true for the events of a few weekends ago when a male lion got out of our stunning Kruger National Park! 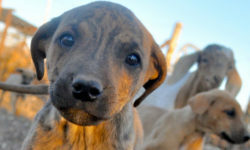 People driving on the N4 highway between Komatipoort and Hectorspruit saw him on the side of the road early in the morning. Now that is something you don’t see every day! Luckily they managed to find the lion and dart it from the SANParks helicopter. 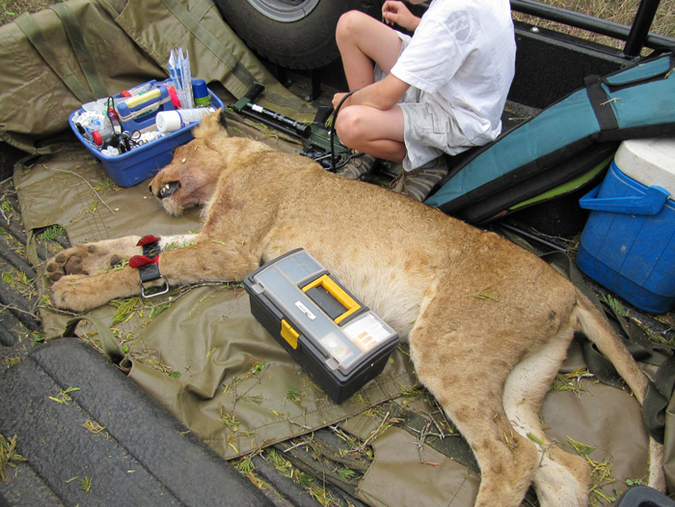 At noon the vet and a reporter brought the lion back home to Kruger through the Malelane Gate. The lion was sound asleep in the back of their bakkie! We happen to live at Malelane Gate and I could not resist the opportunity to go and have a look. I could see that they were in a hurry to get the lion released, but they allowed me to take a quick photo before they drove off. Our escapee looked in excellent condition. He was big! 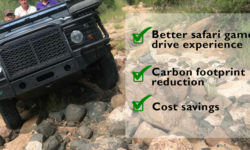 So big in fact that they could not close the tailgate of the bakkie! It must have been a crazy sight: a bakkie driving on the highway with a sleeping lion in the back – only in Africa! Below is a video of the lion casually walking across the road, before it was safely darted and returned to his home in the Kruger. My one friend was a guide. He had the morning off and we decided to go for a bit of a game drive and explore the area between Lower Sabie and Muntshe Mountain. When we got back to camp, it was all chaos, madness and mayhem. There was a huge traffic jam on the no entry road towards the section ranger’s house. People were looking at something through the fence in the day visitors area. We looked at each other, slightly puzzled; a no entry is supposed to be just that: a no entry. What on Earth were all those people doing there then? All of a sudden my friend’s phone started beeping and buzzing nonstop. 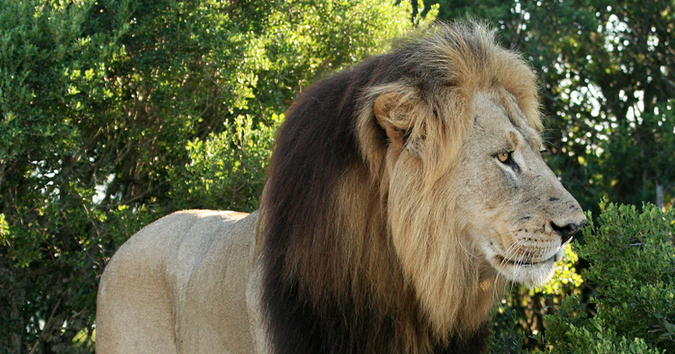 He had over 15 missed calls and text messages: There were lions in camp! Apparently the lions had caught a waterbuck against the fence close to the gate in the early hours of the morning. 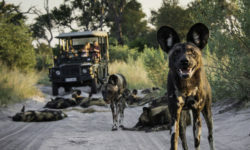 People leaving Lower Sabie were treated to a very special sighting not even 20 metres from the gate, which obviously resulted in a huge traffic jam. Before long, the lions were completely boxed in by the electrified fence on one side, and cars and safari vehicles on all other sides. From what I heard, the lions tried to get away but they couldn’t. They were totally blocked by people in their cars. The only way out for the lions was to follow the fence and try to sneak out behind the cars. Something must have spooked the three young lions because they jumped over the cattle grid and ran straight through the open gate and into the overgrown day visitors area. This meant all hands on deck for all rangers, the duty manager and reception staff. They closed the camp for incoming visitors and issued a warning to all people to stay inside. Especially to the people in the campsite, which is right across from the day visitors area. This is more or less when my friend and I got back from our game drive. One of the other senior guides in Lower Sabie was already on the scene and so was Steven: a good friend back then and now my husband. They had blocked the road running past the day visitors area from both sides and were keeping people at a distance. The SANParks vet was on his way from Skukuza (about an hour’s drive away) with his team. 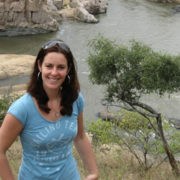 The plan was to dart the lions and to release them back into the bush a distance away from the rest camp and people. I can only imagine these lions must have been scared with all the commotion and attention all on them, and we were all very relieved when the SANParks vet and his team arrived. Now it was time to get the lions back in the bush where they belonged! A SANParks bakkie had blocked the no entry on the other side of the fence and was controlling the traffic. 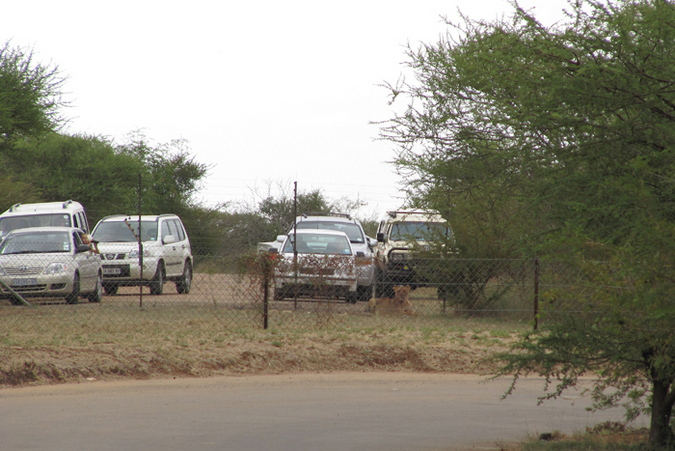 One of the vet’s assistants cut the fence around the helipad and they drove in with their Land Cruiser. They found the first two lions quickly and darted them. We had a look at them before the vet’s assistant took them to the bush to release them. It was fantastic to see a lion up close like that. 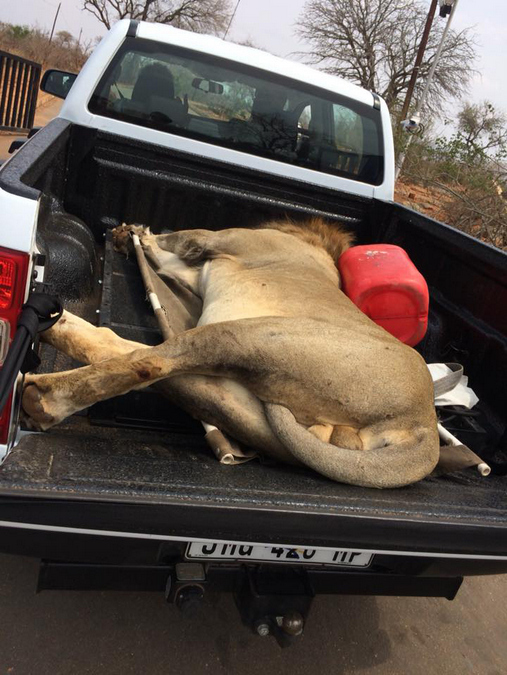 The vet’s assistant was in the back of the bakkie with one of the lions. He explained that they had taken some blood for research and he was monitoring the lions while they were asleep. You don’t want a sleeping lion to all of a sudden wake up while you are right next to it! That would be a bit of a disaster! 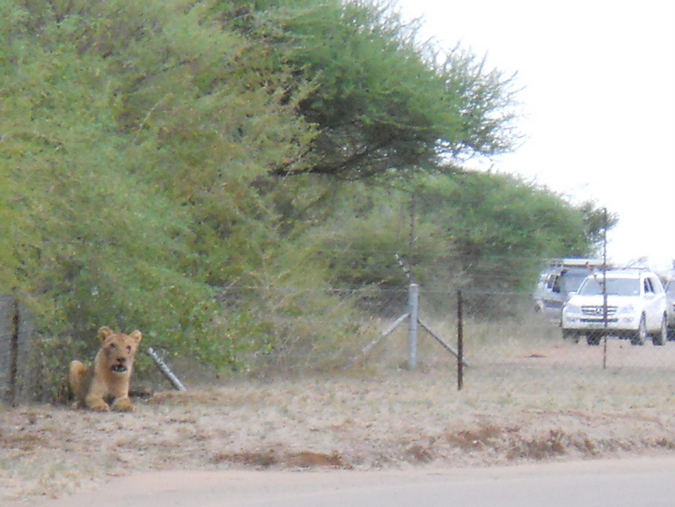 Unfortunately, the third lion was spooked by the vet’s vehicle and it ran into the staff village. There were not many houses in the staff village and the bush there is very overgrown. Which makes it extremely hard to find a scared lion. So after chatting to the vet, they decided that Steven and his colleagues would walk in one line other from the far side of the staff village to the other end, where the vet and his assistant were waiting with the dart gun. The team hoped to flush the lion out and to also dart him successfully. At first, they could not find the lion. They had been everywhere in the staff village. The last place for them to search was a particularly dense piece of bush close to where the vet was waiting. They carefully went in there. By the time the vet saw the lion, it was only about two metres away and almost on top of him. No dart will take effect that quickly so, unfortunately, the vet had no choice but to shoot the lion. This was an outcome that no one wanted. Everybody involved was heartbroken. The rangers, vet, everyone worked so closely together and tried so hard to release all three lions. It all came together nicely with the first two lions but the third one sadly had to be shot. I have to be honest. I was angry and upset. This all could have been avoided – simply by the onlookers giving those lions some space at their kill. I found a little comfort in the fact that the vet was going to take the lion back to Skukuza. They were going to test it for bovine tuberculosis in lions and use it for other research too. And after this incident, they electrified the cattle grid at the gate. So hopefully this will not happen again. This incident happened years ago. I have been in two minds about writing about it, because of the sad outcome. But after the escaped lion from Kruger was returned safely on Sunday, I decided that this also was a story worth telling. Even though it only had a happy ending for two of the three lions. 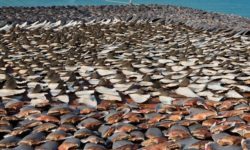 That, unfortunately, is also part of the harsh reality of working with wildlife and with animals in general.